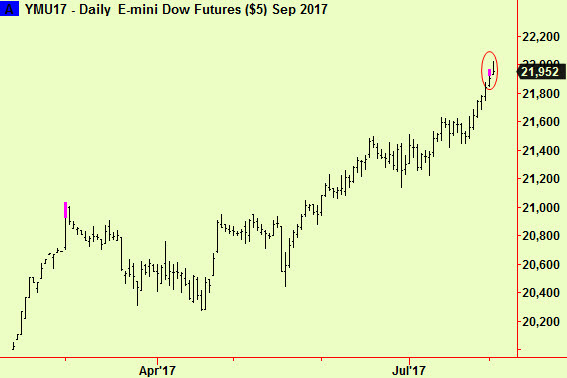 Dow Jones futures have made a daily-scale top extension (by Tuesday’s close). This comes immediately after the occurrence of ‘divergence’ between two Dow indices pointed out on Monday – a Dow Theory sell signal for equities. The Dow Jones Industrial Average itself has risen, ignoring lurching drops in the Nasdaq last week yet the Transport index has fallen away from a failed attempt at a new high while the real estate sector is churning around 10% below the highs (and continuing to compress):This leads us to the conclusion that US stocks are about to enter a period of turbulence, with an increasing risk of drops from hereabouts. The usual health warnings apply to any top extension signal – these mark the actual or imminent end of up-moves, which does not necessarily mean that a down-move will begin immediately. It is more likely that a period of churning will result, probably then to be followed by some more weakness. The shelf-life of these signals is about three weeks, so we would advise trading from both sides of the market for that time, selling weaker US equity instruments on rallies and buying stronger ones on dips. The Dow has been the strongest lately, so we would not choose it as a good ‘shorting candidate’. The Nasdaq and the S&P are both better choices. A confluence of signals across markets/asset classes (you can add an energy complex sell signal too) often occurs near turning points and/or increases in volatility. An energy interim top would be consistent with a US$ bottom.